Are you having issues with Internet Explorer 10 on Windows 8? Is Internet Explorer 10 application not launching in Metro mode and always launching in Desktop mode? Continue reading the post to understand and fix the problem. When Internet Explorer 10 does not launch in Metro mode? On Windows 8 when Internet Explorer is launched from Start screen it launches in Metro UI mode and when launched from Desktop it launches in traditional desktop UI mode. But when Internet Explorer is not set as default browser, Windows 8 always launches Internet Explorer in Desktop mode irrespective of whether its launched from Start screen or Desktop. This generally happens when we install the browsers Firefox or Chrome and set them as default browser. How to restore Internet Explorer 10 Metro mode? 1. 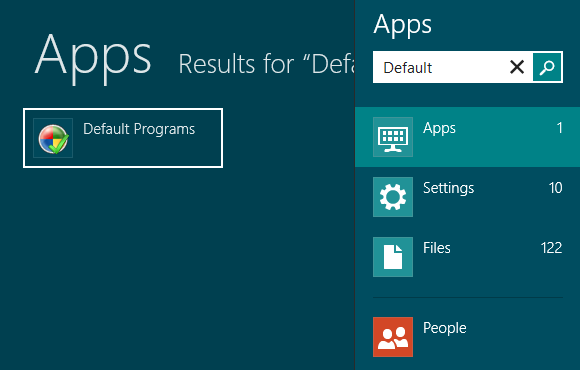 Go to Start screen of Windows 8 and search for Default Programs app by typing Default using keyboard. 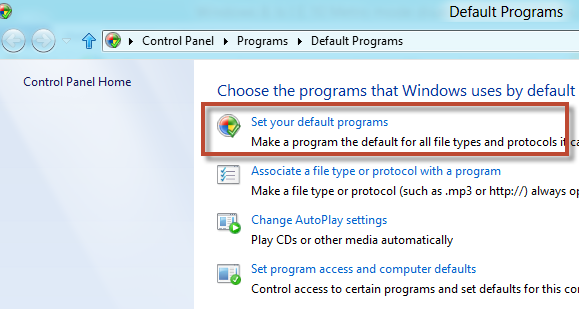 « How to install Windows 8 to dual boot with Windows 7/XP? 3 Comments on Windows 8: Is Internet Explorer10 Metro mode disabled? Here is the fix. Here’s how I fixed it on mine. 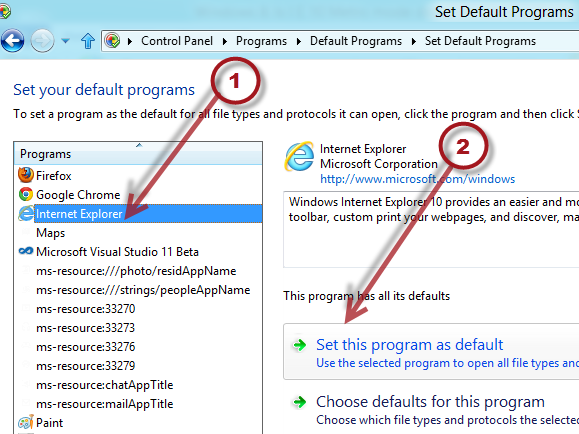 In IE in desktop mode click the gears in the upper right part of the program and click internet options, then go to the tab ‘programs’ then the first option show be run IE as: Let IE chose, Run IE desktop, or Run IE… chose the 1st or 3rd choice. Can you please check if your default browser in Metro and Desktop is set to IE? Which browser is launching when you click a link in Metro App(try People and click on any link) and Desktop (open MS word, type a link and click it)?